Do you want to have your work featured by Manhattan Wind Ensemble and help us shape our identity? Submit a logo design that can take Manhattan Wind Ensemble to the next level. Submit your entry by email to info@manhattanwindensemble.org by 11:59PM EDT on April 15, 2017. This contest is sponsored by Manhattan Wind Ensemble, Inc., a New York non-profit corporation (“MWE”). All participants agree to be bound by these “Official Rules” for the MWE Logo contest (the “Contest”). Entry into the Contest constitutes your acceptance of these official rules (“Official Rules”). By submitting an entry, you agree to the Official Rules and warrant that your entry complies with all requirements set out in these Official Rules. The Contest begins at 12:00 PM EDT on March 15, 2017 and ends at 11:59 PM EDT on April 15, 2017. (the “Contest Period”). ALL ENTRIES MUST BE RECEIVED BY APRIL 15, 2017 at 11:59 PM EDT. The Contest is open to individuals who are at least 18 years of age, and are not a person or entity under U.S. export controls or sanctions. The Contest is subject to all applicable federal, state, and local laws and regulations and is void in Cuba, Iran, North Korea, Quebec, Sudan, Syria, and where prohibited by law. The purpose of the contest is to design a logo for MWE. The logo will be used online and in print. The logo must be suitable for use in printed programs, on merchandise and in social media profiles. Flexibility is a key requirement, including the need to resize easily and to look good in black and white as well as color. The final version of the logo will need to be suitable for high quality printing. You may include multiple versions suitable for different uses. Because MWE will be using the winning Entry as its logo, Participants should take care to ensure that their Entries are not in any way similar to existing logos or other copyrighted images. A logo that cannot be registered as a trademark, no matter how well crafted, cannot win the Contest. • The Winner’s design will be used as the MWE logo starting in May 2017 and continuing through the 2017-2018 season. MWE may continue to use the Winner’s design as its logo thereafter, for as long or short of a duration as the MWE Board of Directors decides. • The Winner will receive two (2) tickets to MWE’s May 2017 concert. • Recognition as our logo designer on the MWE website as long as MWE uses the winning Entry as MWE’s logo, with a link to a URL of the winner’s choice (subject to MWE’s reasonable approval). • Recognition as our logo designer in MWE’s concert programs for the 2017-2018 season, with a reference to your website URL. Potential winners may be required to sign and return within ten (10) days following an attempted notification, an Affidavit, Declaration or Certificate of Eligibility, Liability Release, and Publicity Release. If reasonably requested by MWE, failure by any potential winner to execute and deliver any required documents to MWE by the specified deadline may result in disqualification from the Contest, and selection of an alternate potential winner. Winners may not transfer, assign, or substitute any prizes. 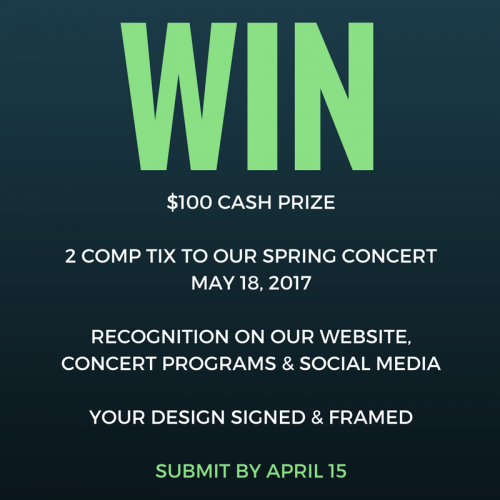 Participants may enter the Contest by creating a logo treatment for Manhattan Wind Ensemble to info@manhattanwindensemble.org. There is no purchase or fee required to enter the Contest. Entries will be judged on creativity, artistic quality, and suitability for use as the logo for a community wind band in New York, NY. The panel of judges (the “Judges”) will be comprised of the MWE Board of Directors. All entries will be judged in comparison with MWE’s current logo. In the event that the Judges decide that no Entry is superior to MWE’s current logo, the Winner will receive concert tickets, $100 cash, and a framed print, but MWE will not adopt the winning Entry as its logo. All Judges’ decisions are final and binding. By submitting your Entry, you hereby grant MWE, a worldwide, non-exclusive right and license to reproduce, prepare derivative works incorporating, publicly display and perform your Entry or any part of your Entry. You agree that MWE may adopt your Entry as its logo and you will not receive any additional compensation or consideration other than as provided herein. You expressly waive any artists’ authorship rights or any droit moral that you would otherwise have under the laws of the State of New York, the United States Copyright Act or similar laws of any jurisdiction. MWE will not be required to pay any additional consideration or seek any additional approval in connection with such use. Additionally, by entering, you grant to MWE the right to use all statements made by you in connection with the Contest, and all pictures or likenesses of you in connection with its promotion of this Contest and your Entry. MWE will not be required to pay any additional consideration or seek any additional approval in connection with such use. You agree to execute any releases reasonably requested by MWE in connection with such uses. You agree that MWE may use your Entry, name, photograph, likeness, and/or voice in any publicity or advertising without compensation or approval (except where prohibited by law). By submitting your Entry, you agree to provide any additional information or materials reasonably requested by MWE to verify your Entry or necessary to promote MWE, the Contest and your participation in the Contest. By entering the Contest, you agree to release, discharge, indemnify, defend, and hold harmless MWE and its directors, officers, agents, employees, and representatives from any and all liability, claims, damages, costs, losses or actions of any kind arising out of your: (i) breach of any representation, warranty or covenant contained in these Official Rules; or (ii) participation in the Contest; (iii) acceptance and/or use or misuse of the Prize in connection with the Contest; or (iv) any third party claim relating to any rights in any Entry. MWE assumes no responsibility for any error, omission, interruption, deletion, defect, or delay in operation or transmission; communications line failure; theft or destruction of or unauthorized access to Entries or entry forms; or alteration of Entries or entry forms. MWE is not responsible for any problems with or technical malfunction of any computer systems, servers or providers, computer equipment, software, failure of any Entry to be received on account of technical problems or data traffic congestion, human errors of any kind, or any combination thereof, including any injury or damage to entrants’ or any other persons’ computers related to or resulting from participation, uploading or downloading of any materials related to in this Contest. THIS CONTEST IS VOID WHERE PROHIBITED. To the extent permitted by law, your rights to litigate, to seek injunctive relief or any other recourse to judicial or any other procedure in the case of disputes or claims resulting from or in connection with this Contest are hereby expressly waived. Failure by MWE to enforce any of its rights at any stage does not constitute a waiver of those rights. These Official Rules shall be interpreted in accordance with New York law without regard to its conflicts of laws provisions. You agree that the state and federal courts located in New York County, New York shall have exclusive jurisdiction over any dispute arising from or relating to these Official Rules, this Contest or your participation in this Contest, and you hereby consent to such jurisdiction and venue. You agree that the ability to participate in the Contest and to compete for the prize offered in connection with the Contest constitute, where required, sufficient consideration for your obligations under these Official Rules. All federal, state/provincial/territorial and local taxes, fees and surcharges and taxes (whether foreign or domestic, and including income, sales, and import taxes) on grants are the sole responsibility of the grant winners. In the event that the selected winner(s) of any grant is/are ineligible, cannot be traced or does not respond within ten (10) days to a winner notification, or refuses the grant, the grant will be deemed forfeited and MWE, in its sole discretion, may choose whether to award the grant to another entrant. If for any reason the Contest is not capable of running as planned, due to infection by computer virus, bugs, worms, trojan horses, denial of service attacks, tampering, unauthorized intervention, fraud, technical failures, or any other causes beyond the control of MWE that corrupt or affect the administration, security, fairness, integrity, or proper conduct of this Contest, MWE reserves the right, at its sole discretion, to disqualify any individual(s) who tamper with the entry process, and/or to cancel, terminate, modify, or suspend the Contest. You agree that personal data, including your name and address, may be processed, shared and otherwise used for the purposes and within the context of the Contest and any other purposes outlined in these Official Rules. The data may also be used by MWE in order to verify the your identity and eligibility to participate in the Contest. The Winner will posted on MWE’s website by May 15, 2017.